A picture is worth a thousand words. I would argue that a scrapbook is therefore worth tens of thousands of words. Scrapbooks are ways for people to collect photos, objects, and other items they deem important in order to reminisce on them later. Of course, as years go by, the value of the scrapbook changes. For modern researchers, scrapbooks become windows into a world that does not exist anymore, or at least one that is very different. 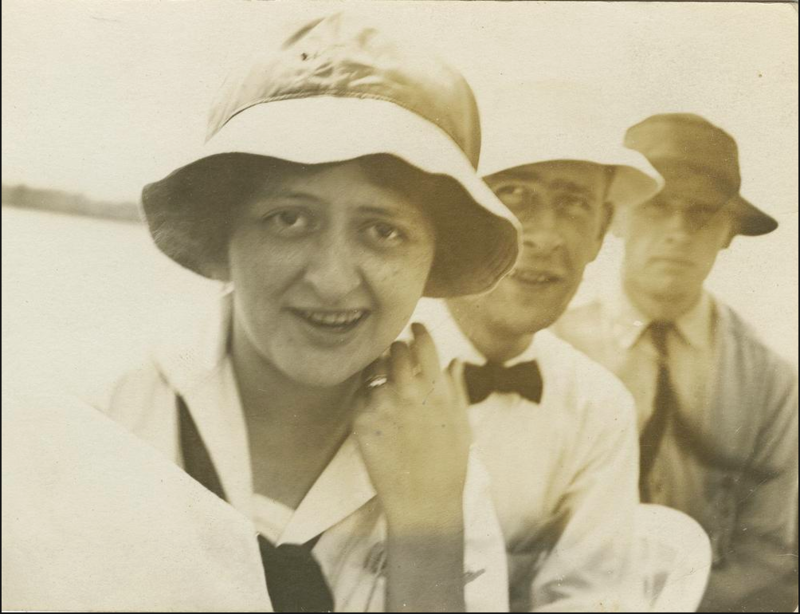 Pauline Day (foreground), circa 1915. Pauline Day’s scrapbook is no different. She lived in Indiana her entire life, starting when she was born in Dunkirk, Indiana in 1894. She and her parents lived in Winchester for most of her life. She came to Indiana University in the fall of 1912 to get her degree in English, though she also took several courses in education. Looking in the Arbutus yearbook of 1916, one might wonder what Pauline did in her spare time, considering she was not part of any student group or sorority chapter. For all intents and purposes, it seemed like she wasn’t very involved in anything. Her scrapbook tells a different story. She has dozens of pages filled with invitations and dance cards and details from sororities for rush week. In her Red Book planners (see below), she marks all the football games she went to and with whom. She even writes some poetry. There are several dance cards from other universities besides IU including Purdue, which she frequently visited. What the school records show is very minimal in comparison to the collection of cards and photos from Pauline’s scrapbook. It brings her and her college days to life. Red Books were a traditional gift given to students at the beginning of every year. They were published annually by IU’s Young Men’s Christian Association from 1892-1971 (see our newly published Red Book collection here!). These small books contained information ranging from contact information, campus organizations, the academic calendar, sporting events, local businesses, maps of the campus, and blank spaces for students to keep their schedules and daily plans. 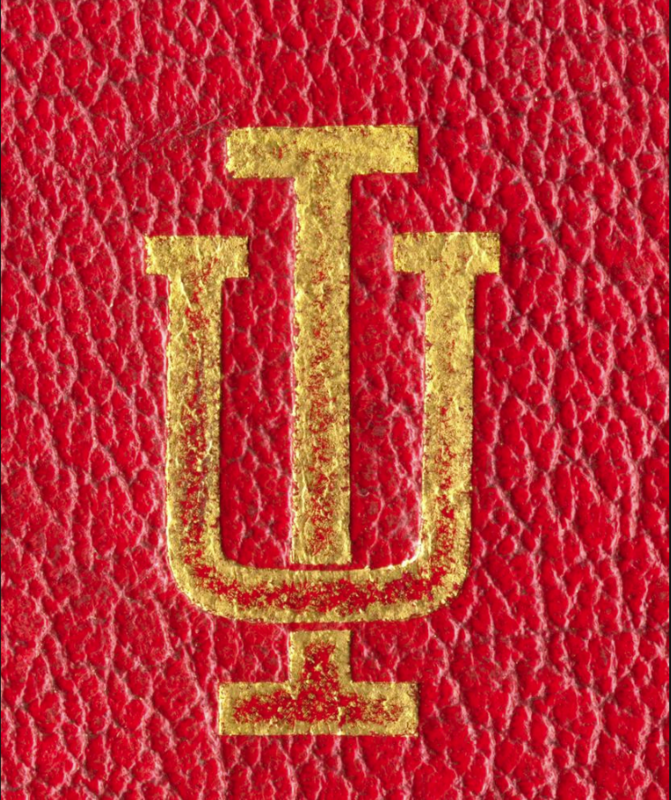 Cover of the 1914 IU YMCA Red Book. Red Books were pocket-sized for easy carrying. IU Archives Photograph Collection P0026932. This collection has two Red Books. One is from the 1914-1915 academic year and the other from the 1915-1916 academic year. Scattered throughout, Pauline has written notes about meeting with her cousin Vivian, what football games or theater events she went to, her term schedule, and other writings such as small poems. These are incredibly valuable resources, since we can see not only what the school was officially doing, but also what students actually did. One place in particular that was mentioned throughout Pauline’s collection was Alpha Hall, a women’s dormitory that used to exist on the corner of Forrest Avenue and 3rd Street, around where Myers Hall is today. It was built in 1906 and privately owned until it was condemned for housing in 1935. Indiana University bought the house in 1936 and used it as a women’s dormitory as well as barracks for soldiers while they were training during World War I. Later, it was used as classrooms and offices until 1961, when it was demolished. For more on the history of Alpha Hall, see “The Demise of Forest Avenue & Alpha Hall” Bloomington Then and Now (blog). 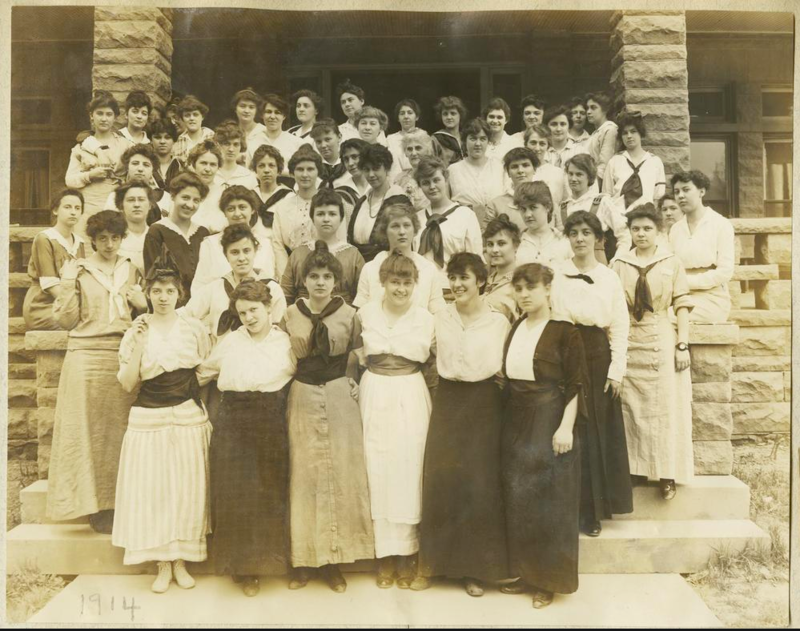 The Women of Alpha Hall, taken around 1914. Pauline Day is in the third row from the bottom, fourth from the left. Pauline listed Alpha Hall as her residence in the two Red Books we have. She also has a few photos of Alpha Hall in her scrapbook, one of which can be seen above. Dance cards aren’t used in today’s clubs, but they were considered souvenirs, particularly for women, in the 19th and early 20th centuries so that women could remember who they danced with and when. Some dance cards also had the songs or dances that were played. It was also a way for a woman to keep track of who she promised dances to, so that no one was forgotten at the end of the evening. These dance cards often included pencils attached with braided cords as a convenient means for dancers to enter names and keep the cards around their wrists. Pauline’s scrapbook contains dozens of these dance cards, some from fraternities and sororities, some from official IU dances, and some from other institutions such as Purdue. 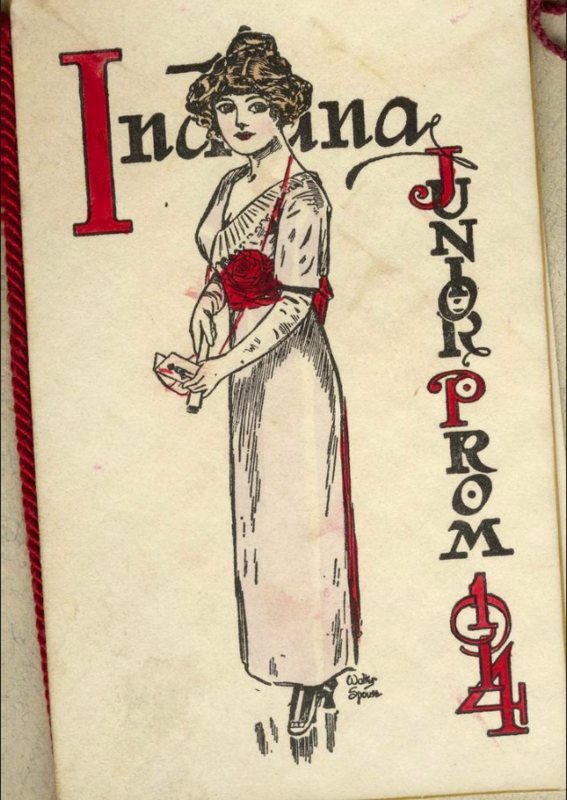 Pauline’s dance card from the 1914 IU Junior Prom. Some dances she barely danced with anyone, at others it seemed like she danced every song. Sometimes she danced with only one partner, and others with several. In any case, we can assume that Pauline enjoyed herself at these events because she chose to keep the cards in her scrapbook. Pauline’s life and scrapbook shows us that there is always something under the surface. Just because Pauline wasn’t involved in many student groups did not mean she was not socially active during her time here at IU. In research, it may not always be clear when something is going to be useful. Sometimes, you just have to give it a whirl and a twirl. For more information on the history of dance cards, see: Dance Card — New York University and Etiquette: A History of Social Dance in American — American Antiquarian. To learn more about the Pauline Day collection or to request an appointment to view the collection, please feel free to contact the University Archives.